I remember when I was a kid, somewhere in my grade school years, I learned about the early explorers who sailed across the ocean from Europe. One of the problems they encountered was that many of them developed scurvy due to the lack of vitamin C in their limited supply of food. It was eventually discovered that their vitamin C deficiency was because, during the long ocean voyages, they had no way of storing and preserving citrus fruits and other produce, the primary sources of this key nutrient. We’ve obviously come a long way since then. Our understanding of the essential nutrients that we require each day to not only keep us alive, but support and enhance good health has expanded greatly. Nutritional measures to combat the growing disease problems have not only increased in demand, but comprise a major area of research. Unfortunately, as with so many of our modern advances – and taking care of our health is certainly no exception – we’re always looking for a shortcut. Taking shortcuts and finding magic solutions to providing for our good health has never worked. Therefore, my intent in this article is to provide a clear understanding of the differences between the artificial and the ideal sources of our essential vitamins and nutrients. According to most research polls, a little over 50% of Americans take supplements. The percentages are greater for older adults than young people, but for the most part the majority of those who take supplements do so for their health. The truth is, supplements provide far more benefits that just daily vitamin support. For more evidence, see my other post; Are Nutritional Supplements Really Necessary. Therefore, I want to provide this information, because as a supporter of nutritional therapies, I certainly want my patients for whom I prescribe supplements, to get the best results possible. And for anyone else reading this, hopefully it will provide important insight as to what can best support your health needs but not waste your money and efforts. You may have heard this before, but there have been many reports published that say nutritional supplements are not proven effective. And there are countless MD’s that tell their patients they are a waste of money. The unfortunate fact is, that these claims are based on legitimate studies. However, all these disparaging findings are based on studies using conventional over-the-counter vitamins and supplements. Most all of which are synthetically manufactured chemical isolates, which, as you are about to discover, are mostly ineffective. It was back in the early 1900’s that scientists began analyzing foods and identifying the compounds we now call vitamins and minerals. It was at that time when the basic chemistry of the body’s metabolism was discovered, showing where vitamins and minerals take part in our metabolic pathways and make life happen. Vitamin and mineral deficiency diseases were also just beginning to be recognized, and for decades it was assumed that it was the individual vitamins or minerals that were responsible for the life-supporting benefits of food. During this early discovery, it began making sense that the consumption of multi-vitamins and other nutritional supplements could be applied as a means of nutritional support. Before the popularity of daily vitamins caught on, food supplementation was being implemented. Vitamin fortification of many foods began after 1920 as a public health policy to address various socio-economic malnourishment issues. While it seemed like a good idea at the time, it didn’t take long for pharmaceutical companies to begin manufacturing chemical nutrients: synthetic replications of the individual compounds identified as vitamins and minerals. These laboratory-created vitamin replicas are what we now call chemical isolates. For example, manufacturers can isolate and extract a sugar molecule from corn and chemically tweak it so that it mimics the ascorbic acid molecule found in foods. They then label it as vitamin C and sell it. Unfortunately, ascorbic acid is only part of the vitamin C complex. All of the other highly valuable bioflavonoids and antioxidant compounds that accompany vitamin C are nowhere to be found. But this was not well understood at the time. However, since the earliest times when relationships between foods and their life supporting nutrients were first being discovered, to now with nearly every known nutritional compound being artificially manufactured, we are coming back to a more fundamental understanding of how those vital nutrients actually work. The fact is there’s much more to the composition of whole foods than just individual vitamin compounds. We now know that natural vitamins, present in their authentic food source, also have in association with them, several hundred other chemical entities. These include certain essential trace minerals, chemical co-factors and co-enzymes that act as organic catalysts, without which the complex of nutrients cannot produce their full vital effects. These essential associated food factors are not found with synthetic vitamin isolates. If you’ve ever looked at the label of common over the counter multivitamins or individual vitamin supplements, you will see that the amounts of these synthetic isolates are in extremely high concentrations. Isolated vitamin concentrations are often over 100% of the recommended daily allowance (RDA), and often they are higher than 1000%! Why would they need to be that concentrated if they were effective? Whole food nutritional supplements are nowhere near the extreme levels found in conventional chemical isolate vitamin supplements because they work efficiently with your body’s metabolism. The complex of nutrients found in whole foods are therefore thought of as ‘biologically active’. You may think of vitamin C when you eat an orange or Vitamin A when eating carrots for instance. However, there are actually hundreds of other chemical entities that make up nutritionally superior whole foods. Just as your body is biologically active, you can understand that when you take in whole foods, it clearly recognizes the complex of metabolic activity in the foods which then instantly become assimilated into your metabolism. The intricate nature of whole foods, especially whole food supplements, and their nutritional importance has been discovered by investigating the outcomes in test subjects when individual components of vitamin complexes are removed. The symptoms of physical degeneration and functional failures in animal and human subjects who were supplied with products lacking some of the essential elements is unmistakable. 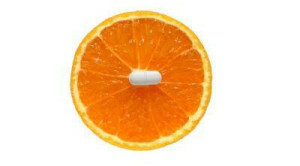 An Australian doctor applied a vitamin C regimen from whole food sources to treat a hemorrhagic condition which resulted in a complete cure of the condition. Later, a colleague tried to produce the same therapeutic effect for a different patient but used pure ascorbic acid (chemical isolate fraction of the vitamin C complex) but they obtained no response. These findings are just a few of thousands which confirm that vitamins are part of food complexes and must be associated with their natural synergists (“co-workers”) to be properly utilized and be a potent nutritional factor. The successful outcomes of dietary based, whole food therapies are undeniable. Treatment protocols that include whole food-derived vitamins and supplements are well researched and provide reproducible and clearly effective results. The whole food supplements I prescribe are from Standard Process, the leader in whole food, organic nutritional supplements. Standard Process has been a leader in the nutritional field for over 85 years. I have learned my lesson on many other supposed ‘quality’ brands – none come close to the successful outcomes and countless satisfied patients who continue to use Standard Process supplements. While I coach and promote optimal dietary practices, I also assess a patient’s needs and recommend any appropriate supplements that may further support or improve their health. The success of the therapies I prescribe are based on the complex nature of whole food supplements that provide the complete biologically active components essential to the body’s well-being. There will always be some controversy surrounding the use of supplemental nutritional support whether it’s vitamins or more targeted supplement formulas. The makers of synthetic supplements will continue to defend their products and the medical community will continue to dishonor them. I find It a tremendous contradiction in the fact that our government agencies continue to require the vitamin fortification of many processed foods, yet at the same time, they support the published claims by pharmaceutical studies that vitamin supplements provide no health benefits. I could waste a lot of time disputing the abundance of biased and poorly done studies that use synthetic supplements to discredit the nutritional field in general, but I would prefer to continue serving my friends’ and patients’ health needs with continued success. The facts are undeniable; there are thousands of individuals who are living proof of how effective and sometimes even life-saving a well-designed nutritional protocol can be. When done properly, using well formulated products produced from sources which include all the biologically active co-factors which only whole foods can, and prescribed appropriately, the outcomes are highly consistent and reproducible. Did you find this informative? Share this post! Understanding what we should or shouldn't be eating and what supplementation can help us, and how to apply it properly is overwhelming. Overcoming problems with weight, energy, digestion, and just about every other disease is successfully accomplished in only one way, through nutrition. Even people who "eat well" often have imbalances or are missing nutrient components that could easily put an end to health problems when applied correctly.